What is the difference between Kunzea, Tea Tree, and Manuka essential oils? The kunzea plant is native to the southern coast of Australia and is referred to as “White Cloud” for its bulbous tops and whimsical blossoms. It grows wild along the southern coasts of Australia and Tasmania and has been used by native cultures for centuries. We extract Kunzea essential oil by steam distilling the leaves and green branchlets of the botanical. 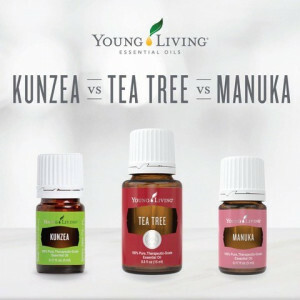 Kunzea has similar properties and uses as Tea Tree essential oil, but it has a more pleasant scent and a milder sensation when applied topically. The aroma is spicy and woodsy but has a sweet scent as well. It contains high levels of alpha-pinene and eucalyptol, which make it awesome to use after a workout to soothe fatigued muscles. It is also great to add to your daily skin care routine. Apply it topically on your face to help reduce the appearance of blemishes. Since the scent of Kunzea is sweet, we also love diffusing it! Diffuse it in your home to help purify the air from unwanted odors and to create a relaxing atmosphere and a refreshing respiratory experience. One of the oils used in our popular Purification® blend, Tea Tree essential oil is also known as Melaleuca Alternifolia or Melaleuca oil. This tree originates from Australia and France, and steam distillation is used to extract the essential oil from the leaves of the plant. The key naturally occurring constituents in Tea Tree are terpinen-4-ol, gamma-terpinene, and alpha-terpinene. It has long been a favorite in the beauty industry because of its countless beauty benefits. Tea Tree’s aroma is very woodsy and masculine; it’s not often diffused because the scent is very strong and potent. It is more commonly used for topical application for its skin-cleansing properties and its ability to help maintain healthy-looking skin and reduce the appearance of blemishes. People love adding Tea Tree to homemade deodorants and household cleaners because it can help eliminate musky odors. You can also apply it on toenails or feet to help maintain the appearance of healthy skin and nails. Manuka essential oil comes from the same botanical family as Tea Tree (Myrtaceae) and is distilled from the Leptospermum scoparium (manuka) tree. Steam distillation is used to extract the essential oil from the leaves and small stems of the tree, which is native to New Zealand and Australia. The key naturally occurring constituents in Manuka essential oil are leptospermone, copaene, and isoleptopsermone. Manuka essential oil smells the sweetest and most mild of these three oils. It smells very rich, warm, and pleasant. Because of its gentle fragrance and numerous skin benefits, we love adding Manuka to our daily beauty regimen. It is so easy to add to your favorite skin products to support healthy-looking skin or to use as a spot treatment to reduce the appearance of blemishes. In fact, Manuka essential oil is one of the oils used in our Maximum-Strength Acne Treatment. You can also add Manuka to Thieves® Household Cleaner or diffuse it with Peppermint to help spice up the scent of your home. We love applying it along the bottoms of our feet after a long day!